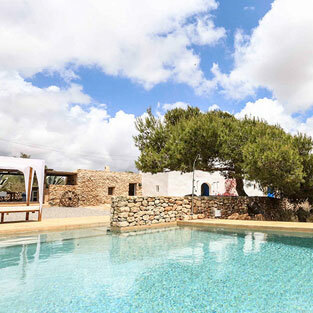 Can Marlin is located in Cala Jondal, very close to the popular beach, Ibiza town and the airport is 10 minutes away. The villa is completely fenced and all on one level. Easily accessible through an electric gate and plenty of parking. For the villa is a covered terrace with a dining table for 8 people. The villa is equipped with a cozy living room, a separate kitchen fully equipped. All bedrooms are tastefully decorated and with air conditioning. A total 3 bathrooms all with a walk in shower and toilet.